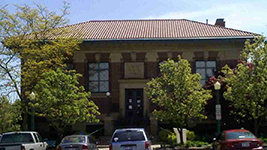 The mission of the Herrick Memorial Library is to provide diverse library resources for education, information, and recreation of the community. To assemble, preserve and administer, in organized collections, books and other educational and recreational materials in order to promote the communication of ideas, an enlightened citizenship, and enriched personal lives. To support the educational, civic, and cultural activities of local groups and organizations. To provide the opportunity and encouragement for continuing education to all. To seek continually to identify community needs to provide programs of service to meet such needs, and to cooperate with other organizations, agencies, and institutions, which can provide programs and services to meet these needs. To provide opportunities for recreation through the use of books, music, films, and other media. The Library Board meets in the Library’s Board Room (downstairs) at 10:30 a.m. on the second Tuesday of each month. Wellington has had a library as far back as the 1840s, when a local merchant kept a rental library in his store. In 1886, the library association turned its holdings over to the trustees of Wellington Township, and the first truly public, tax-supported library was established. The Library building was given to the people of the community by Myron T. Herrick. As a youth here, Herrick was a dedicated reader; and when he became a successful Cleveland banker, he could think of no better gift for his home town than a well-stocked, well-equipped library. The building was designed by Cleveland architect J. Milton Dyer and erected in 1902 on the site of the historic American House hotel. In 1928, Myron Herrick, then serving as ambassador to France, returned to Wellington to dedicate the plaque at the main entrance in memory of his parents. When Ambassador Herrick died in 1929, he left a bequest to finance an addition to the library which more than doubled its size. In 1984, the voters of the district approved a bond issue for expansion and renovation of the library. An addition and two mezzanines were built, increasing floor space by about 1,800 square feet. The library was made accessible by a new ground level entrance and elevator. The completely renovated library was dedicated in September, 1986. The library has been an asset to the community for over 100 years. Its 6,000-plus users borrowed over 100,000 books and items in 1998. Ambassador Herrick’s legacy to his home town is alive and well.